The rifle class has a long range, but all the weapons use a 30mm red dot scope, which makes their effective range shorter than the sniper class. There are two primary weapons that simulate the rifle class, the M-16 replica and the Commando rifle with adjustable stock. The M16 is most often simulates the M16-A2, while the Commando most often simulates the G-36. However, the M-4, AK-47, AK-74, the Steyr Aug among others make great simulations. Each weapon simulation has different firing rates, magazine sizes, and reload times. 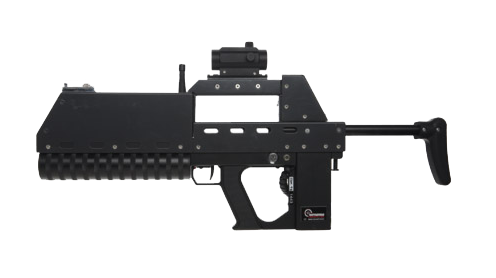 Depending upon the weapon simulation they also function in fully automatic, burst fire, and semi-automatic modes. The M-16A2 is the latest in the M-16 series of weapons dating back dating back to the early 1960’s. Until recently the venerable M-16 series has been the staple weapon of the US military. Most recently, the M-4 has started replacing it, also simulated by the system. You can read more about the history of the M-16 on Wikipedia. The G-36 is admittedly a personal favorite and often the weapon of choice for us in games like Call of Duty and Rainbow Six. It’s more compact form, using the Commando form factor, accuracy and range make it an excellent choice for a variety of skill levels. You can read more about the history of the G-36 on Wikipedia. The light machine gun class is an advanced class of weapon. Popular LMG’s like the M-249 and M-60 add a new dimension to gameplay as the LMG class is a support class. Many people think of Sgt Mac in Predator running around with the M-60. Similar to the real thing, our LMG class is a heavier weapon and features a 30mm red dot scope. Like other weapons it has a simulated recoil that means that it is not as accurate, BUT it’s high rate of fire and large ammo capacities make it an incredible base defense weapon and an excellent assault support weapon. The submachine class of weapon is a great choice for just about all ages, skills, or fitness levels. It is lightweight, and easy to use. It is a great choice for just about any scenario, especially close quarters or in games where everyone has the same class of weapons. It will demonstrate its weaknesses on larger maps, as the other classes of weapons are more effective at longer ranges.